Dental emergencies are never planned or enjoyable. At First Line Dental, Dr. Stanko and our team strive to accommodate patients in need of urgent care as soon as possible, often providing same-day appointments. Don’t hesitate to contact us today in Manchester, CT! 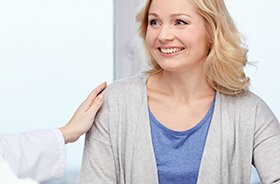 Why Choose First line dental for Emergency Dentistry? While serious toothaches are most likely caused by an untreated dental infection, some cases can be caused by a piece of food or stray debris that’ s caught against the gum tissue. Try rinsing your mouth with warm water and flossing. If the pain persists or worsens, contact us in Manchester as soon as possible. It is safe to take OTC medication to control your symptoms, but don’ t touch it directly to the tooth or gum surfaces, as this may cause additional discomfort. If the edge of the tooth is noticeably jagged or uncomfortable, you can place a piece of gauze or even sugarless gum over the edge(s) to prevent cutting on your tongue or cheeks. Additionally, a cold compress can help minimize any facial swelling that occurs because of the injury. Once you arrive at our dental office, we can start planning restorative care to rebuild the tooth properly. First question: do you still have the tooth? If so, reimplantation may be possible, but there is only a small window of time available to make this happen. Contact First Line Dental right away and then try to gently place the tooth back into its original socket, holding it there. Alternatively, you can carry it in your cheek pocket or a separate container of milk; the trick is to keep it consistently moist. Apply gauze with pressure to keep any bleeding under control in the interim. The unexpected loss of a crown or filling isn’ t necessarily as urgent as the above emergencies, but it can lead to lingering discomfort in everyday life because the treated tooth is now exposed to pressure and temperature once more. Do you still have the crown? Try gently placing it back where it was before; some denture adhesive can help it stay secure, which can be found at most pharmacies. Remember to schedule an appointment with Dr. Stanko so that you can have the restoration replaced or professionally reseated as soon as possible. Remember to schedule checkups and cleanings every six months! Our team can pinpoint signs of dental decay and damage in their most harmless stages, providing conservative treatment and successfully preventing future emergencies. Limit your exposure to foods that are overly tough to chew or sticky. Additionally, don’ t chew on the solid ice in a cold drink! You could crack your tooth. Use scissors and other appropriate tools when opening packages – don’t rip into them with your teeth! Every emergency appointment is different; some patients can be sent on their way with a simple prescription for medication, while others may need a new dental crown or state-of-the-art tooth replacement with dental implants. There’ s no way to tell until we see you in person! 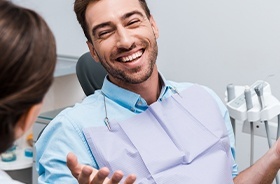 Rest assured, though, that First Line Dental accepts most insurances and offers flexible payment options to make your care as affordable and financially stress-free as possible. After a comprehensive evaluation, we’ ll provide a full breakdown of recommended services and cost information so that you can proceed confidently with care.